Kristin, what special considerations did you have when naming your characters? Did you use the names of any real people? Kristin: My books, Carpe Diem, Illinois and God on Mayhem Street, are contemporary novels so I didn't have to do the research you did to name my characters. However, Carpe Diem, Illinois deals with unschooling (a form of homeschooling where learning is child-led) so I wanted to honor to leaders of the unschooling movement. With that in mind, I named a major secondary character "John Holden", in honor of John Holt who was the founder of the unschooling movement. Kate Dobbs is a twist on the name Sandra Dodd who's an incredible unschooling activist. Other names just popped into my head, like my protagonist Leonardo (Leo) Salvatore Townsend. It wasn't until my third or fourth draft that I realized why my subconscious wanted "Townsend" -- Leo's a reporter who's sent to investigate a small town. Another set of advice warns the writer not to use famous/infamous names. For instance, a reader is likely to have some preconceived notions about a character named Elvis or Adolph. However, if using that name is embedded in the plot of your story, then by all means, go for it. Kristin: I didn't have a whole cast of characters. I had a few characters in mind when I started writing and a vague idea about how they'd interact. I'm generally a pantser (I write by the seat of my pants), so I write each character as they come to me. I definitely do some tweaking. In Carpe Diem, Illinois, the antagonist was originally Richard Stebbins. As I developed Leo more, I realized he was a womanizer and knew that by turning the antagonist into a woman I'd add another layer of conflict. I went through a lot of female names (the internet is great for this) and finally came up with Raegan Colyer. Valerie: I love the name Raegan, but I have a daughter named Reagan, so I’m biased. In my series, I went back and fixed a few things. I wanted to make sure that each of the women in the Circle of Nine and their descendants had the same set of initials. It doesn’t really matter, but it did help me keep track of who was related to each other. With that in mind, let’s talk about organization of names. I keep a spreadsheet of first and last names that I’ve used, so I don’t accidentally use a name twice. This wasn’t that important when I only had one book, but it got more complicated when I got to book two and three. I had more secondary characters than I could keep track of and a spreadsheet became my friend. How do you organize your character names, Kristin? Kristin: I use Scrivener writing software. Scrivener operates a lot like Word in that you have blank sheet of paper to work on, but to the left of that is a column with folders for things like scenes, places, and character sketches. Under the character sketches folder, I have a list of individual folders for each character labeled with their name. As I'm writing on the blank sheet, I can glance over the list to make sure I'm using the correct name or not reusing a name. It's also easy to add a new name and character sketch as Scrivener lets you split the screen of your work-in-progress to enable you to develop two things at once. Valerie: In my research about naming characters I came across a cool word I’d never heard before – Cratylic, which means names that express a unique trait about a character. I used this somewhat by including a fire-themed name for three of my teen characters; Brigit Blaise Quinn because Brigit is known as the Fire Goddess and for added fun, I made her middle name Blaise. Ember Hanratty because again ember connects with fire, and Bodaway Corrigan because Bodaway is a Native American name for fire maker. Kristin, did you play around with any of your characters’ names that way? Kristin: Yes, and it's so much fun to do. I'm currently working on a young adult, dystopian trilogy called The Devil Particle Trilogy. The main character in the first book is named Paul Salvage for reasons that will become obvious to the reader. Paul's girlfriend Jaelyn has the last name of Bellamy which means "beautiful friend". Gaige, a secondary character, has the surname of Devlin which means "unlucky" or "unfortunate". Gaige's older sister is Valkyrie. Valkyries were Norse angels who determined who would be slain in battle and who would survive. And Gaige's younger sister has the musical name of Lyrik. Typically, this name is spelled with a "c" but I changed it to a "k" to give it more of an edge. Valerie: Oooh, those are cool names! I can’t wait to read this book!! So you definitely thought about name meanings. I love alliterative initials, too. There are other ways to create themes for character names by considering the era and location of your story along with the age and ethnicity of the character when picking a name. Knowing the meanings of unusual words and roots of words can be a big help, too. Kristin, what other things would you recommend considering? Kristin: Be sure not to use similar names which might confuse your readers. For instance, Jane and Janet. Election time is a great time to discover new, current names -- all those yard signs! And if you're stuck and internet searches are leading to dead ends, ask your readers for help. I had a hard time naming Gaige's dog so in my newsletter I asked for suggestions after letting them know that nine-year-old Lyrik discovers the dog digging up potatoes in their garden. Readers sent me over 15 names, but the winner was "Spuds". Perfect. Valerie: Ha! I love the idea of asking readers for help. You can get the best creative suggestions that way, plus it’s fun to give readers the chance to be part of the process! Thanks, Kristin, I feel like we just had a chat over a cup of coffee! Kristin Oakley advised us about the helpfulness of Critique Groups in July, explained all about Hybrid Publishing in September, and told us how to make the most of Writing Conferences in October. She is a Chicago Writers Association board member, the managing editor of The Write City Magazine and The Write City Review, the past president and a co-founder of In Print Professional Writers’ Organization, and a UW-Madison Division of Continuing Studies adjunct writing instructor. 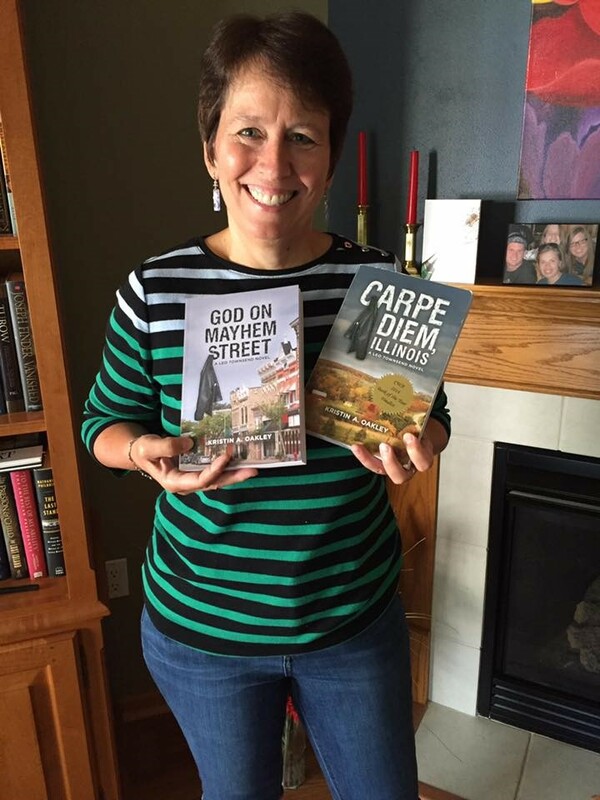 Kristin’s debut novel, Carpe Diem, Illinois, won the 2014 Chicago Writers Association Book of the Year Award for non-traditionally published fiction, was a finalist in the Independent Author Network 2015 Book of the Year, and a runner-up in the 2016 Shelf Unbound Best Indie Book Competition. Its sequel, God on Mayhem Street, was released in 2016. She is currently working on a young adult dystopian trilogy. I also try to vary the number of syllables in each name. Readers might get annoyed (or at least notice, which might take them out of the story) if every character had a one-syllable first name and a two-syllable last name. I also like to give antagonists names with s's in them and hard consonants. S sounds are reminiscent of snakes (always dangerous, right?) and hard consonants imply toughness, decisiveness, difficulty for the protagonist, etc. I also try to avoid creating names that turn out to be impossible to type easily. ;-) Polish last names leap to mind. I created one character named "Czarnowski" and it didn't flow well off my fingers so I kept him as a very minor character (typed it only two or three times). Thank you ladies for sharing a bit of your creative process with us, and also for sharing these naming resources! Happy writing! Thanks, Amanda. It's nice to have all those resources bookmarked. I particularly had fun playing with the fantasy name generator one, even though I'm not writing fantasy right now.